For those who possess a disability or handicap, life is frequently defined by one’s physical limitations. Overcoming those limitations then takes on certain importance, as no one wants to be forced to rely on others for their basic needs. In the realm of personal hygiene, having the right handicap hygiene equipment can be the sole determinant of this independence. It can literally be the difference between taking care of oneself and forced reliability on others. Fortunately, there are many inexpensive, easy-to-use pieces of handicap hygiene equipment available today for a variety of disabilities and hygiene needs. Use them while taking care of your hygiene and make cleaning easier. With bathing aids such as wiping aids, safety bars and shower chairs, an individual with leg or hip trouble can still perform the necessary bathing duties by either using the safety bar to assist entering or exiting the bath or by using a chair or stool to sit while showering. Additionally, wiping aids to help with cleaning your bottom can extend your reach by 14 to 21 inches. Lack of reach, dexterity and strength are often the reasons for hygiene problems. Here are a few situations one might encounter and the recommended hygiene equipment. Washing the back – Reach is the biggest problem when comes to washing the back, so much of the equipment are long in length. Scrubbing and cleaning your feet – These foot scrubbers allow the users to stand and move their feet back and forth on pumice stones, brushes or bristles. Squeezing the toothpaste out – Get every last drop of toothpaste out easily by pressing down on this device. Shaving hard to reach body areas – These razor handle extenders can save you from strain and grief when grooming. With an additional 19 inches of reach, you should be able to shave anywhere on your body. Works on standard and electric razors. 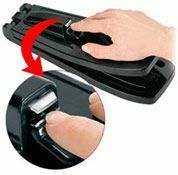 Unsteady or weak hands when clipping nails – Increase the leverage when clipping your nails and have a larger base for stability. Works one handed too. Applying lotion to all areas of body – Easy to clean sponge applicator with a long handle. Wash your hair without using water – This no water shampoo easily rinses and can be dried off with a towel. They are refreshing and has a pleasant smell. 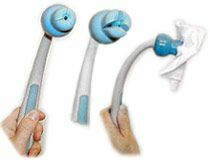 Wiping your backside after using the toilet – The Freedom Wand and the Bottom Buddy are both great toilet aids. These handicap devices will aid people with disabilities whening wiping themselves on the toilet. Read more about these products below. If you are looking for an all purpose hygiene aid, consider the freedom wand that is capable of self wiping after toilet use, shaving, applying lotion or ointment and reaching all those hard to reach places. These are great handicap toilet wipe devices that cater to the elderly, someone with limited upper body mobility, short arm length, pregnant women, obese or large sized individuals. 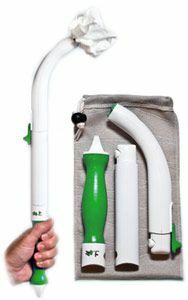 For assistance when using the toilet, wiping aids such as the popular bottom buddy allow handicapped individuals with reach issues to clean themselves by attaching the toilet paper to a flexible plastic arm that extends one’s reach without stress or strain. If you require some toilet hygiene without reaching towards your back, consider bidet toilet seats. They provide a stream of water directly to your bottom and can clean it without the need for wiping or toilet paper. These are only a few of the many different products available to handicapped individuals to aid them in their personal hygiene needs. Such products are designed to last a long time with a minimum of maintenance and be helpful and usable to a wide range of disabilities. Additionally, many of these products are relatively inexpensive and, in fact, can save the individual hundreds of dollars over the long run when the alternative costs of home health aides and live-in nurses are factored in. When living with a disability, the quality of one’s life is often measured by the degree of one’s independence and the proper handicap hygiene equipment can help to secure that independence, instill confidence, and improve the quality of life overall.